See our farewell song to our wonderful leaders! We are so greatful for such a beautiful experience. Praised be God! Home of our Holy Church. Really do intercede for you. Who pour out their love for you. The Wonderful Papa of Rome. If ever a Papa there was. Papa Francis is one because, because. Because, because, because, because, because, . . . . . The Wonderful Papa of Rome! Follow Sister Hanah. Follow Sister Hanah. She is wise and she is canny. Yet one who’s won our full trust. She can find most any path. We feel we just might cry. For the love you’ve shown to us! The Wonderful Lord of us all. We here He is a wonderful King if ever a King there was. Because, because, because, because, because . . . . .
Because of the loving things He does. We’re off to serve our Lord! The Wonderful Lord of us all! First, a flashback. After finding that the procession down the Tiber River in honor of Our Lady of Mount Carmel was not last night as we had thought, the sisters returned home. Later, we enjoyed a celebration of our own on the roof of the Domus. The cool popsicles on a warm Roman night were a real treat, but the best treat was celebrating with our sisters! Relaxing on the rooftop on a warm Roman evening. Our final Sunday in Rome began with Mass at the Basilica of San Clemente with its beautiful mosaics and frescoes. The relics of St. Cyril, who with his brother St. Methodius brought Christianity to the Slavic peoples, also are located there. This was an unexpected blessing for the sisters whose communities originated in Slavic lands. Before entering the Basilica of San Clemente for Mass, Mother Regina Pacis explains the history of the 12th Century basilica. Following Mass, a few sisters headed to their own excursions while the rest of the group proceeded to pray at the churches of Sant' Agostino, with the tomb of St. Helen, Saint Louis of France, Santa Maria sopra Minerva, where St. Catherine of Siena is entombed, and S. Maria ad Martyres, better known as the Pantheon. During this short morning pilgrimage we encountered beautiful works by Bernini, Raphael, Michelangelo, Caravaggio, and many others who used their artistic talents to give glory to God and to inspire His people. Michaelangelo's "The Christ" in Santa Maria sopra Minerva. The fresco behind the altar in the room where St. Catherine of Siena lived and died. The sisters exit the large sacristy of Santa Maria sopra Minerva after visiting the room of St. Catherine of Siena. The tireless and knowledgable Mother Regina Pacis briefs the sisters on the history of the Pantheon, whose portico dates back to the 1st Century AD. Following a delicious Italian evening meal of veal, pesto pasta, salad and lemon angel food cake, the sisters ended the day enjoying a movie. This morning brought the joy of returning to the Vatican Radio Chapel again, this time for the 7:30 a.m. Latin Mass. The particular beauty of celebrating the Liturgy at the Studio Chapel defies easy description: on the one hand, you are gathered with a small group of believers, on the other, you are worshipping with thousands, perhaps millions of brothers and sisters throughout the world. As we learned during yesterday's tour of Vatican Radio, towards the end of World War II the attraction of its broadcasts enfuriated Adolf Hitler to the point of ordering it bombed, notwithstanding the fact that Rome had been declared an "open city" (restricted to any and all attacks) in virtue of its artistic treasures. By the grace of God, the solitary bomb dropped on the Vatican missed this target, as well as St. Peter's Basilica itself - a mere 50 meters away. As our group entered the Vatican Gardens, it became quite evident just how close a call this was. Shrapnel marks from the attack immediately next to the Basilica have been maintained to record divine protection. While none of our group had checked the Internet for Rome weather, surely today's Discomfort Index must have reached the high nineties. Having been briefed last night about the Vatican Garden sprinkler system, it was a joy to discretely share in a little "watering" ourselves. As we ascended towards the peak of the small hill comprising the Gardens, we came upon the residence of Pope Emeritus Benedict XVI - who was absent, or we would never have been allowed in, we were told. Exploring the Vatican Gardens in a liesurely fashion, we fell into conversations with one another as we wound our way past blessed greenery - trees and plants far more numerous and beautiful than the staunch survivors of the crowded neighborhoods below. We CMSWR Renewal Sisters have spent more than two weeks together now: time to deepen old friendships, time to begin new ones. As our three weeks in Rome draw to an end, we Sisters feel deep gratitude to all who have made this unforgettible experience possible - our communities and benefactors, the entire Domus Team (including those behind the scenes), the guides to the many places we visited and the priests who gave us such outstanding conferences. In all of this, though, we owe a special debt of gratitude to Sr. Mary Kathleen, RSM and Sr. Mary Hanah, RSM, our leaders. Truly our God is a God of surprises. As we were winding up our tour of the Vatican Gardens, we came across an elderly cleric and his companion,who greeted us amiably, introducing himself (in Italian) by saying "I'm just a poor priest. Then they made me a bishop, and then (papal) nuncio to Chile. Now I'm retired, so I don't wear my cross or ring." Well. As it turned out, our "simple priest" was none other than Cardinal Angelo Soltano, Secretary of State under St. John Paul II and staunch proponent of Domus Sanctae Maria Guadalupe from the very outset. What a gift to run into such a benefactor! His eminence, shifting to quite good English, asked us about our dicoeses and apostolates, then led us in praying the Our Father in Latin for Pope Francis as he visits Paraguay. On our way out of the Gardens we became...well, just a bit lost. Here we see Sr. Mary Hanah leading us out in triumph! It was an exhilarating day beginning with Mr. Sean Patrick Lovett speaking with us about the history of Vatican Radio and the way in which the Catholic Church continues to use technology to spread the Gospel. After the papal states were taken in 1870, Popes for the next 59 years were "prisoners of the Vatican," an area of 100 acres. Living in this far from ideal reality and yet desirous of fulfilling the Lord’s mandate to teach all nations, Pope Pius XI sought out the Marquis Guglielmo Marconi. The two would frequently walk in the Vatican Gardens discussing the opportunities which radio could mean for the world. On February 12, 1931 Pius XI broadcast Christ’s message in Latin to the city and to the world for the first time! Thus began Vatican Radio. Soon after, Pope Pius XII used the radio as a vehicle to denounce racial hatred toward the Jews and the death camps of World War II. After the war, it was used, among many other things, to help people find lost family members. Pictured is the microphone used by Pope Pius XI on February 12, 1931. The microphone is imbedded in a piece of the same marble which Michelangelo used to sculpt the Pietà. The Sisters and Mr Lovett at the Vatican Radio. Mr. Lovett will accompany Pope Francis to the United States in September, 2015! Next we journeyed to the Jewish Synagogue of Rome and received further perspective on human history. There has been a Jewish community in Rome even from 200 BC. These first Jews came after the victories of Judas Maccabeus and lived peacefully in the city. In the year 70 AD, the Romans destroyed the temple in Jerusalem and brought back its treasures and many of its people as slaves. This is depicted on the Arch of Titus which we saw earlier on our tour of ancient Rome. The Jewish community living in Rome, however, purchased back their countrymen from the Romans and set them free. We learned of various times of persecution of the Roman Jews, sometimes sadly by the Catholic Church, right up through World War II. Our Jewish guide concluded by telling of the historic moment in 1986 when Pope John Paul II visited the Synagogue and called the Jewish people, "our elder brothers." This visit was follwed by a visit from Pope Benedict XVI. They are now looking forward to a visit from Pope Francis in the future! The Sisters are standing in from of the altar where the Torah is read. The Sisters are pictured walking toward the Synagogue. Two of the Sisters made a quick trip to deliver a package to the Venerable English College and were able to see this beautiful painting and a list honoring the priests who had attended this college and given their lives in martyrdom during the Reformation. 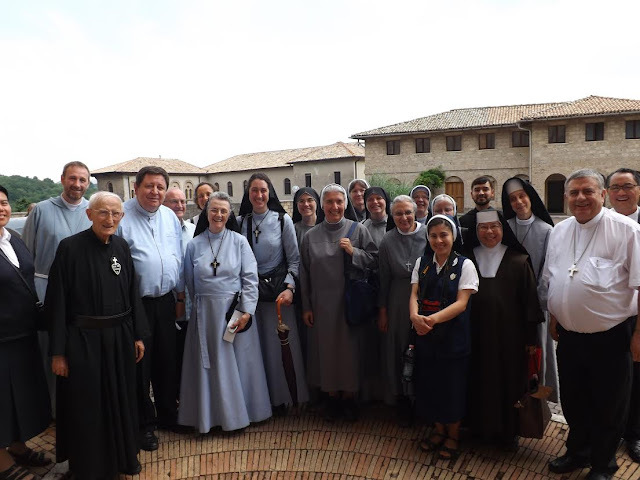 What a surprise to meet the Prefect for the Congregation for Religious, Joào Cardinal Bràz de Aviz, along with Father Lemoncelli during our tour of the Monastery of St. Scholastica at Subiaco! Father Lemoncelli graciously caught up to us with this picture of our group taken earlier this week. We had a serious start to the day as we recalled the challenges of Pius XII in the midst of WWII. Here his image reflects his posture on July 7, 1943 as he surveyed the massive destruction to Rome in the bombing. The western front of the adjacent Basilica of St. Lorenzo was badly damaged in the bombings, but was rebuilt in a manner similar to the original. The Sisters have gone to great efforts to insure that our educational opportunities would be grace filled. Here and in some of the pictures you might see cords going under veils, and black neck bands. We had small receivers which allowed us to hear our tour guides, whether they were several steps in front of or behind us. We could also hear them as they whispered into their microphone in the places of worship, enabling us to better understand the works of art and architecture before us, while maintaining an atmosphere of silence and prayer. The Baptistery at St. John Lateran, named after both John the Baptist and John the Evangelist, is as huge as it is beautiful. Here you see the marble baptistery which could be used for full immersion. The group of us at our finest! A small group of pilgrims at St. John Lateran Basilica. A group of pilgrims heading up the Holy Stairs at Sancta Scala. All those going up the staircase on the right, do so on their knees. These are the stairs that were ascended by Jesus as he was judged by Pontius Pilate. The stairs were moved from Jerusalem and covered with wood, which is well worn by pilgrims through the years. Nothing adds to the culture like the Swiss Guards. Sister Mary Kathleen salutes them as she approaches them, they salute back. I don’t think she could know them all, but she seems to somehow. Today a note went up to pray for one of the guards named Ivan who plans to return home and go to the seminary. The culture at home in the Church for him will be considerably different than here in Rome, so we remember him in prayer. Monsignor Lopes, a priest of the Congregation for the Doctrine of the Faith, received us at the CDF this afternoon. Monsignor Lopes has presented a short course on the Mysteries of the faith in six rich lectures to the group of us. Today he took a detour from the Mysteries and helped us understand the CDF and how it serves the Church and the faithful. We are so blessed to have such priests willing to serve in such unique roles. Happy Birthday Sister Hanah! Sister is one of our fearless leaders, along with Sister Mary Kathleen and Mother Regina Pacis, what a blessed experience they have created for the group of us. Our day began with morning prayer and Mass at the church next door to the Domus, San Carlo ai Catenari. Next we embarked on a walking tour of ancient Rome led by Mother Regina Pacis. Mother is a scholar of ancient Rome and early Christianity and gave wonderful, easy to understand backgrounds and descriptions on all of the sites that we visited. We walked to several Roman forums and visited several churches that are the resting places of early saints and martyrs located near the ancient ruins of Rome. The hot summer Roman sun could not dampen our interest or enthusiasm as we prayed in the Basilicas of Sts. Cosmas and Damian, which is also the headquarters of the T.O.R. Franciscans, and St. Frances of Rome. Finally, we prayed at the Basilica of St. Peter in Chains, where some chains from his imprisonment are displayed and Michelangelo's famous sculpture of Moses is located. Mother Regina Pacis explains ancient ruins encountered on our way to the Roman forum. The sisters climb the steps to the current Roman city hall. The building was designed by Michelangelo and sits adjacent to the Roman forum. We are ready to learn about ancient Rome! This photo was taken just outside the Roman forum. One of the many beautiful views of ancient Rome looking toward the Palatine Hill..
Next to the Roman forum sits the Mamertine prison where St. Peter was once imprisoned. It is also possible that St. Paul was briefly imprisoned here. Sr. Mary Alma and Sr. Paula in front of a 5th Century icon of Mary and the Child Jesus at the Basilica of St. Frances of Rome. The ancient icon was recently discovered behind an icon from the Middle Ages that is located above the basilica's main altar. The sisters returned to the Domus for nourishment and a short rest. Later in the afternoon Msgr. Steven Lopes from the Congregation of the Doctrine of the Faith arrived to continue his conferences on the mysteries of Christ's life and their importance and meaning for our lives today. Msgr. Lopes sharing his theological knowledge and insights into the mysteries of Christ's life. We look forward to the blessings that the Lord has in store for us tomorrow, and also to celebrating Sr. Mary Hanah's birthday! Once more, we returned to St. Peter's Basilica for a 7:00 a.m. Mass, this time with Msgr. Fucinaro, a priest of the Diocese of Lincoln, Nebraska, currently serving in Rome. Our prayerful introduction to the day continued following Mass, since we had ample time for private prayer and the Sacrament of Reconciliation in the Basilica. Mid-morning we were privileged to receive a guided tour through the Vatican Mosaic Studio by Carla, one of the eleven artists serving there. To our surprise we learned that all but one of the "paintings" in St. Peter's are in fact mosaics! Our guide showed us an immensity of neatly cataloged mosaic chips of every conceivable color - the small (sometimes tiny) building blocks of exquisite works destined for one of three recipients: St. Peter's itself, visiting dignitaries or private patrons. An average piece, Carla explained, takes about three months to complete. At the close of our time together, she presented each of us with a mosaic chip as a souvenir of our tour, asking us in turn for our prayers. Following this she led us over to St. Peter's to view her own masterpiece: a large mosaic of the Sacred Heart. On the way over Carla almost casually pointed out the entrance to a not particularly impressive building immediately next to the Vatican Mosaic Studio. "That's where the Holy Father lives," she informed us. "We see him coming to work every day." The mosaic of the Sacred Heart in St. Peter's Basilica that our talented guide restored. Front door to Pope Francis' home! When we re-convened back at Domus in the afternoon, Mother Regina Pacis, SFMG, presented a university-level lecture on Rome of the first centuries A.D.,with an emphasis on its wavering attitude to nascent Christianity. As she explained, the approach of the various Emperors towards the emerging Church during its early years varied from a kind of "Let sleeping dogs lie" philosophy to one of persecution of inconceivable brutality. All this to set the stage for our "Ancient Rome" walking tour tomorrow. Rounding off our greatly enriching (albeit quite warm) day, we Sisters walked the short distance from our temporary home at Domus to the Church of Santa Cecilia in Trastevere ("across the Tiber"). There Sr. Margaret, an English Benedictine, kindly led us on a fascinating tour of the church, underground chapel and remains of the home of one of the earliest and most venerated of martyrs. St. Cecilia, virgin and martyr, you remained faithful to Jesus your Beloved in the face of family rejection and the fury of a state which could not tolerate your preferential choice for Christ. Pray for us, that we, too, may have the courage to cling to Him alone in our own hour of testing. Amen. Newly discovered ancient tiles after a fairly recent flood. St. Cecilia, virgin and martyr, you remained faithful to Jesus your Beloved in the face of family rejection and the fury of a state which could not tolerate your preferential choice for Christ. Pray for us, that we, too, may have the courage to cling to Him alone in our own hour of testing. Amen.